Do you think it's time to make improvements to your kitchen? Maybe you have a lovely large space but just aren't happy with how it's looking. Or maybe it's quite small, and you want to come up with some creative new ideas to make it look bigger. Well, you're in luck. 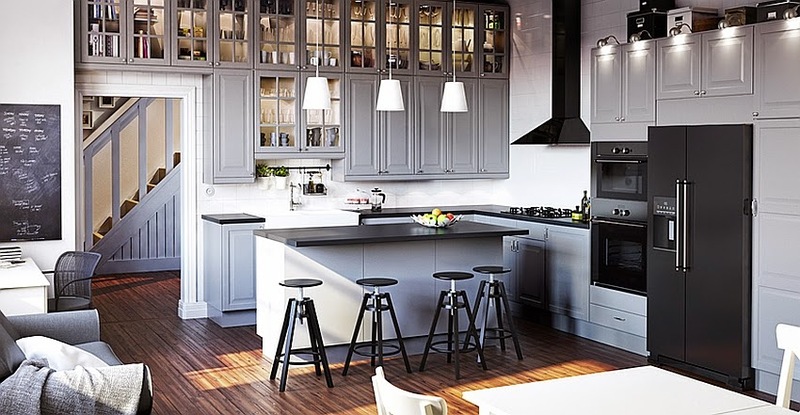 Here are some easy tips and tricks to giving your tired old kitchen an update. You can go wild with this as there is an endless amount of colors out there to choose from. It is also one of the cheapest ways to create a new look without having to cash out. If you want to funk up your kitchen, then go bold and choose a bright red, or purple, or even a few different colors and paint some funky stripes! Get creative and make a beautiful feature wall, use it as your blank canvas and have fun. If you don't feel confident enough to do this, then maybe wallpaper would be a better option for you. Just be sure to choose wallpaper that is made specifically for the kitchen; this means it will be steam and heat resistant. Have you ever gone into a home store, and seen the beautiful marble worktops that look so clean and sleek? Well, you could have that in your kitchen! Wood is also a lovely look to have in the kitchen, but if you go down this route, it is very important to make sure the wood is treated properly so you don't get left with problems later down the line. If your cabinets are still in good nick, then don't change them just for the sake of it, it'll cost you money for no reason. Instead, just take the doors or handles off, and change them to something more suitable for your new, vibrant kitchen. By all means, mix and match - create something entirely unique that no one else will have. If you want to go all out, then you can't leave out the floor (unless of course, you love it!) But it's no good giving everything else a much-needed upgrade and neglecting your floors. It's a good idea to do them either first, or last, to make sure that they fit in with your other ideas. Most designers can just run the flooring underneath the plinths as a pose to fitting it in from wall to wall, essentially saving you a lot more money too. You would be surprised at how much of an impact a sink would have on a kitchen, so shopping for one should be done with an open mind. What kind of vibe do you want your kitchen to have? If you like to make a statement, then go for a modernized granite sink. You can find these, and even more kitchen sinks at Tap Warehouse. Just remember how you use your sink area too, for example, if you do the washing up by hand, you may find that a larger double bowl style would be much more practical for you. If you're sick of your rusty cutlery and ugly looking toaster - get some new ones! Isn't it lovely when everything matches? There are many places that you can shop at to get matching items, but a great way to shop is online, as you have a wider range of things to choose from. Sorting out all your clutter will already make a great difference to improving your kitchen. This is why storage is very important to hold your bits and bots in an organized manner. The more space you have in your kitchen - the better. So instead of just a few cupboards, get some pull-out drawers installed inside the unit, so you're making most of every possible inch. This is a really simple feature to add, but it looks very cool, and it's so useful and efficient too, let alone all the room it saves you. Most pan racks can be attached by yourself with a few nails. - Once that's done, hang up all your pots, pans, and even utensils. This can also be a form of artwork if placed in the right place, so don't try and hide it somewhere in the corner - own it. The effect that lights have in the room are very strong. As this is a kitchen, you will need to make sure that you can see clearly, as you will be cooking and chopping things up. But not only that, they can create the whole atmosphere of a room. So instead of just having one bright light, think about getting some low hanging lights, or spotlights that are built into the ceiling itself. We all like accessories, but if they aren't done correctly, it will just look like clutter and you definitely don't want that. So think about what you want to add, and what purpose it has. This could be some artwork on your walls or ornaments on your shelves. Even plants add a wonderful touch of life. If you have a house full, or you're known for throwing some ravishing dinner parties, then this will apply to you. Even if you have a tiny kitchen, you can usually squeeze in a table and a couple of chairs. Think about what will work best for what you've got. If you have a large area, then you have more of a choice to pick from, so decide on the style you are going for, and then bring it to life. Now you know all the tips and tricks, (some more subtle than others,) have a think about what you want to do, and how far you want to take it. Maybe you just have a few little things you want to change, or maybe it's time for a whole new makeover!